Research trial says antimicrobial thereapy alone is still the best BRD medicine. In the battle with bovine respiratory disease (BRD), beef producers and veterinarians have begun to add ancillary treatments on top of antimicrobial therapy, but it may be a wasted effort. A recent study by animal scientist Blake Wilson and others at Oklahoma State University showed no significant health improvements from adding ancillary, or secondary, treatments to basic BRD antimicrobial therapy in feedlots. This was a rare study with large numbers of cattle. Generally, these ancillary treatments have been divided into three broad classes based on their intended purpose. They have been categorized in several scientific papers. Category 1. Relieve the harmful effects of inflammation with corticosteroids and non‐steroidal‐anti‐inflammatory‐drugs (NSAID). Category 2. Block histamine activity, therefore inflammation, with antihistamines. Category 3. Boost immune system function to aid in the defense of infectious pathogens by use of vitamins, minerals, direct‐fed microbials (DFM), and vaccines. 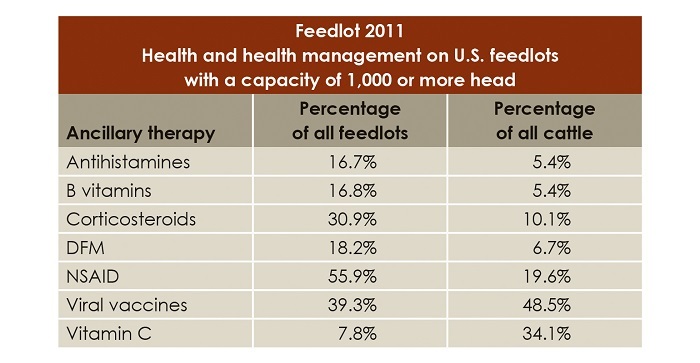 The chart accompanying this story from the 2011 NAHMS feedlot survey shows the most common ancillary treatments and their frequency of use at that time. The 2011 NZHMS feedlot survey showed this list of favorite BRD ancillary treatments. Wilson and others wanted to test some of these therapies because they could find very little data on their efficacy. They chose the three most-used ancillary therapies at the time, which included non-steroidal anti-inflammatory drugs, anti-viral vaccines and vitamin C.
They used 516 steers and bulls with an average weight of 475 pounds, purchased at a variety of Oklahoma auction markets in a one-week period and shipped them an average of just over 80 miles to a feedyard. The calves were commingled into receiving pens, given free choice access to prairie hay and water, and allowed to rest 24 to 48 hours prior to initial processing. That initial processing included a combination IBR, BVDV Type 1 and 2, PI3, and BRSV; a multi-clostridial including Clostridium chauvoei, Clostridium septicum, Clostridium novyi, Clostridium sordellii, and Clostridium perfringens Types C and D; and a name brand ivermectin for internal and external parasites. They also recorded individual body weights, castrated 355 bull calves and tipped horns on 57 calves. Calves were visually monitored by trained evaluators and given a clinical severity score in a modified DART system, which includes scoring for depression, abnormal appetite, and respiratory signs. Secondarily they used rectal temperature to determine treatment eligibility. All those pulled with a score of No. 1 or No. 2 and a temperature of 104 degrees or greater. All those pulled with the more severe clinical signs of No. 3 or No. 4 regardless of temperature. All calves with scores of No. 1 or No. 2 and no fever were returned to their pens without treatment. They found negligible differences in performance among any of the three popular ancillary treatments, either in the receiving or finishing period. Increased body weight when receiving the third antimicrobial for BRD. 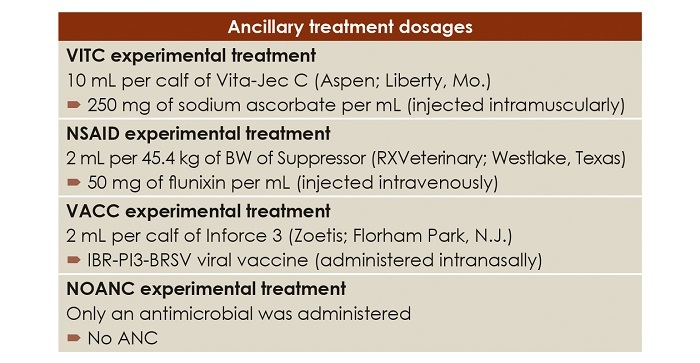 Increased ADG between second and third antimicrobials. Fewer fourth antimicrobials administered than viral-vaccinated or vitamin C groups. This suggests the calves receiving only the antimicrobial were performing better, and that may have important additional implications. Wilson explains: "I believe that these were extremely high-risk calves that were suffering from an intense naturally occurring immune challenge (first-treatment morbidity of 66.5% and mortality attributed to BRD of 13.2%). With the help of the diagnostic lab, we identified Mannheimia haemolytica, Mycoplasma bovis, Pasteurella multocida, bovine viral diarrhea virus, and bovine coronavirus in three random calves that were sent in for necropsy. Ultimately the researchers summarized ancillary treatments are most likely an unnecessary expense and offer no benefit to calf health or performance. Will NSAIDs help BRD treatment? In a literature review, Wilson and others noted the non-steroidal anti-inflammatory drugs might be justified for animal welfare and comfort, or they may provide no benefit, or in some cases they may provide negative influence. “As you know, NSAIDs such as flunixin meglumine, which we used in the experiment, have been shown to reduce inflammation and fever in beef cattle,” Wilson says. “I think there are two issues here. One, a fever is a natural biological response by the body to a pathogen/immune challenge. I don’t know that a fever is necessarily a bad thing in all circumstances, and I don’t know that we fully understand the costs versus the benefits of relieving the fever, just the symptom, and how that impacts the response to the pathogen/immune challenge. “The other issue is how we use these products in practice versus how the products work pharmacologically. For example, the industry commonly would administer a dose of flunixin meglumine along an antibiotic at the time of BRD treatment. That animal then would not likely receive another dose of flunixin meglumine until it met the PTI requirements and was pulled again days later if it didn’t respond to the initial BRD treatment. That said, the half-life of flunixin meglumine is only 3.14 to 8.12 hours, according to the label, so at best we are relieving the symptoms of the calf for a few hours.